What do I do with my preschoolers while I teach? How can my husband help? The FAMILY God’s Weapon for VictoryRobert Andrews – WinePress Publishing 1883893240On the subject which is close to all our hearts deals with many of the issues we all are challenged by as homeschooling families. Beginning by setting out the roles of husbands and wives and then on to children (including a treatment of discipline) this book sets out to equip families to be the very best they can be. There is also thought-provoking discussion of ‘family planning’ and “courtship”‘. I like the comment on the back cover which states “This book is a bit like Narnia’s Aslan – it is not safe, but it is good.” Be prepared to be challenged and changed by this book. Gaining Confidence to TeachDebbie Strayer – Common Sense Press 1880892987Forty-Two Confidence-Builders to Encourage Christian Homeschoolers. Debbie Strayer (Executive Editor of Homeschooling Today magazine) speaks from the heart concerning such topics as the call to home school, relatives, support groups, tesst results, curriculum, relationships at home, facing changes and enduring trials. Teaching PrimariesRuth Beechick – David C Cook Pub Co / Accent Publications 0896360547This book is about 6/8-year-olds what it means to learn concretely instead of abstractly, the best system of memorising and what they can understand about God. Home Grown KidsRaymond and Dorothy Moore – Word Publishing 0849930073HOME GROWN KIDS (or children!) The Moores believe that many education problems as well as potentially severe damage to family moral and spiritual values can arise from too much formal school too soon. In Home-Grown kids they present well-documented evidence for these conclusions, and they urge parents to consider the option of home teaching, especially in the early years. Better Late Than Early: A New Approach to Your Child’s EducationRaymond and Dorothy Moore. – Readers Digest 0883490498Read, sing and play with your children from birth. Read to them several times a day, and they will learn to read in their own time as early as 3 or 4, but usually later, some as late as 14. Late readers are no more likely to be retarded or disabled than early ones. They often become the best readers of all with undamaged vision and acute hearing, more adult-like reasoning levels, mature brain structure less blocking of creative interests. Yet late readers are often falsely thought to be in need of remedial help. If you have any doubts about your youngsters, have a specialists check vision and hearing possibly see a neurologist if there are no problems, relax! The Busy Mum’s Guide to Simple LivingRaymond S. Moore, Dennis R. Moore, Dorothy N. Moore. – Crossway Books / Jackie Wellwood 0891079572An excellent source of inspiration for home-educating Mums addressing the areas of healthful living, saving money, organising for smooth household management etc. Spiritual Mothering: The Titus 2 Model for Women Mentoring WomenSusan Hunt – Crossway Books 0891077197Giving encouragement and practical guidance for modern women to implement the principles of Titus 2 in today’s church. I found this a very exciting book, if more women took this seriously, we could revolutionise the church and begin to meet needs which currently are being overlooked. This can only lead to a stronger church for us and our children to grow up in. All the Way HomeMary Pride – Crossway Books 0891074651This is the sequel to The Way Home. Building on the theme of the home as the centre of life, you can discover something of what is possible for families today. Chapters such as `marriage for mortals`, `Is there life after TV` with suggestions on starting and running a home business, and how the family can reach out to and influence and minister to the community. A very provocative book but even if you don’t agree with everything Mary Pride says, it will get you searching the Scriptures. Home Educating With Confidence: How Ordinary Parents Can ProduceRick & Marilyn Boyer – Holly Hall Publications 0964539632Written from a Christian prospective, the Boyers show us how ordinary parents can produce extraordinary children. They belive that learning is a natural function and can happen better at home than anywhere else. The Boyers write with love and an incredible respect for their children. Drawing on 17 years of home education experience they show us how to start right and stay right. For the Children’s SakeSusan Scheaffer McCaulay – Good News Pub 089107290XWhat is education? An excellent book, showing how education should begin with a true understanding of each child as a unique individual made in the image of God. It is very important for all parents to become vitally involved in their child’s education, even if they are not home-schooling. There are various ways in which parents can be actively helping in the area of education and this book presents many of them. All the Way Home: Power for Your Family to Be Its BestMary Pride – Crossway Books 0891074651This is the sequel to The Way Home. Building on the theme of the home as the centre of life, you can discover something of what is possible for families today. Chapters such as `marriage for mortals`, `Is there life after TV` with suggestions on starting and running a home business, and how the family can reach out to and influence and minister to the community. A very provocative book but even if you don’t agree with everything Mary Pride says, it will get you searching the Scriptures. What The Bible Says About Child TrainingJ Richard Fugate – G C B Pub Group 1889700134This excellent book stands in contrast to humanistic child rearing methods. It is thoroughly Bible based. Written to instruct, aid, and encourage, it is a MUST for every parent and prospective parent. Training Children in GodlinessMichael McHugh – Christian Liberty Press 1930092024A tremendously encouraging little book written by a Puritan on the theme of Proverbs 22:6, full of practical suggestions and insights. Plants Grown Up – Doorposts 1891206109Editorial Review:Book Description:One day we noticed that our boys were growing up on us! There was (and is) still lots more to teach them about becoming godly men! We realized that we needed goals to aim for and a plan to help us reach those goals. Plants Grown Up is the result. This 500-page, spiral-bound book offers hundreds of ideas for Bible study projects, reading material, and practical, everyday activities to help train your sons for godly manhood. One copy of this book can be used with all your sons from the time they can memorize simple Bible verses until the day they each get married. (And then they can save it to use with your grandsons!) Each chapter offers a variety of reading, writing, Bible study, and active projects for you to choose from for each of your unique sons. Projects in each chapter are listed in order according to increased difficulty. Start work in each area with young boys, and continue to disciple your sons with increasingly more difficult assignments. Each project is labeled with the school subject it relates to, enabling homeschoolers to easily incorporate projects into their regular school plans. Evaluation questions at the end of each chapter help parents and sons pinpoint weaknesses, discuss areas of improvement, and pray specifically for spiritual growth. Many reproducible charts and forms encourage serious Bible study and self-examination. Fully quoted memory verses (King James Version) make consistent memorization and review easier. Sources are listed for all recommended resources. Reproducible planning sheets, calendar pages, record sheets help you organize to reach your goals. PLANTS GROWN UP can help you raise your boys for GodÂ¿s glory! It is also a great resource for boysÂ¿ club ministries, grandparents who want to be more involved with their grandchildren, and counselors seeking practical learning projects for boys. Over 500 pages. Recovering Biblical Manhood and Womanhood: A Response to EvangelJohn Piper – Crossway Books 0891075860This weighty volume is subtitled ‘A Response to Evangelical Feminism’ which makes it sound much less interesting and relevant to the homeschool than it really y is. This is a thorough treatment of the proper understanding of male/female roles which is particularly helpful for parents who hope to train up their children to be stable and Godly parents in the next generation. So much of our culture is deliberately undermining the uniqueness of men and women and this error even pervades the church. We as mothers of boys especially will be vastly helped in our job in the present and will be enabled to help our boys to find the right way for them to develop if we would take time to read and assimilate the essays in this book. I highly recommend it. The Three R’sRuth Beechick – Arrow Press 0940319063Covers reading, language, arithmetic and gives practical help and lesson outlines from the earliest level to approximately age 9. Dr Beechick is a master of praiseworthy, practical teaching ideas. All of her books offer sound advice and give worthy ideas to help you teach easier and successfully. This book is simple and easy to read and sensible. This set of three is extremely affordable and worth more. The methods provided will give you self-assurance you need to teach. Books Children Love: A Guide to the Best Children’s LiteratureElizabeth Wilson – 0891074414A guide to the best children’s literature For all those of us who have wondered which books are suitable for which age group, this book is very helpful. Books are listed and reviewed under several sections including biography, humour, literature, animals, special days and seasons etc. Help your children to learn to appreciate good books and get to know them like friends. Hearts and HandsDarrel Trulson – Christian Liberty Press 1930092008Beginning drill in letters, phonics and numbers (workbook). Hugenout GardenDouglas Jones – Cannon Press 188069221XA Children’s Story of Faith ,Huguenot Garden is a children’s story of the daily and adventurous episodes in the lives of René and Albret, young twin sisters in a seventeenth-century, French Protestant family. The story follows the twins and the rest of the Martineau family as they work, worship, commune, and suffer persecution together. For children five and up. D’Nealian Handwriting Manuscript ABC Book: Handwriting Practice – Good Year Books 0673360202I bought this book for my 5 year-old who is now in Kindergarten. I was very impressed with the various ways in which it encourages young ones to practice their writing. It contains guides for each letter, rhymes, pictures to color geared to the letters, and best of all, pull-out cards to use to review the process. Well worth the price for your beginning writer. D’Nealian Handwriting Cursive ABC Book: Handwriting Practice Boo – Pearson Education 0673360229I bought this book, along with some others, for my 2nd grader this past winter. It contains the usual practice areas for writing the letters, as well as a poem on each page to copy, emphasizing the chosen letter. The best part is the pull-out practice cards which allow a youngster to review the process of forming the letters by tracing with their fingers (a process the Montessori method uses as well). An excellent resource for your child. Ready to Use Fine Motor Skills & Handwriting Activities for Youn – Center for Applied Research in Education 0130139424This practical series is designed to help early childhood teachers, P.E. specialists, special educators, and therapists develop and improve motor skills abilities in all children who have coordination and movement difficulties, ages 5 and up. Each book in the series contains hundreds of developmentally age-appropriate activities to build young children’s competence and confidence in specific skills in a positive, enjoyable learning environment. The primary focus is to provide quality teaching, assessment, and remediation to meet the specific needs of each individual child. Reader Rabbit Toddler – B000068NNKEditorial Review:Amazon.com Product Description:Toddlers ages 1 to 3 experience the joy of learning with Reader Rabbit and friends. From hide-and-seek to peek-a-boo games or playing with onscreen blocks, drawing crayons, and more, this title’s delightful characters come to life onscreen and create an enchanting learning environment for toddlers. No mouse clicking or other computer skills are required; toddlers strike any key to move the activities along. Plus, a new Dreamship activity filled with funny sounds and silly animations promises to amuse even the tiniest of tots.Reader Rabbit Toddler 2002 is part of the award-winning Reader Rabbit children’s educational software series. Toddlers discover a world of fun characters, interesting shapes, and colorful graphics in the CD-ROM’s 20 interactive play areas. They’ll also delight in this title’s memorable sing-along tunes and fun printable activities.To ensure that you’re never without Reader Rabbit, Reader Rabbit Toddler 2002 comes with a special bonus CD-ROM, Reader Rabbit’s Dreamship Tales. Bursting with added activities, videos, tunes, and more than 100 printable games and activities, it’s a great way to keep the fun going after you’ve turned off the computer. Explore Reader Rabbit’s world and discover colors, shapes, songs, animals, letters, numbers, and more. Your child will be captivated and delighted by this enchanting land of fun and learning activities! First steps into a world of learning and discovery. JumpStart Kindergarten Lowercase Letters WorkbookLiane Onish – Cartwheel 0439164184School sure looks fun to Hopsalot the Bunny and he’s ready to take his friends through a learning-filled day. At gym, in the library, at lunch and especially on the chalkboard, he’s got lots of fun ways to practice lowercase letters. And get ready to put a carrot sticker in your kids’ baskets every time they learn something new! JumpStart – it’s a great way to prepare for school! School sure looks fun to Hopsalot the Bunny and he’s ready to take his friends through a learning-filled day. At gym, in the library, at lunch and especially on the chalkboard, he’s got lots of fun ways to practice lowercase letters. And get ready to put a carrot sticker in your kids’ baskets every time they learn something new! JumpStart – it’s a great way to prepare for school! Creative Home Schooling: A Resource Guide for Smart FamiliesLisa Rivero – Great Potential Press 0910707480For a comprehensive guide to home-based education, that does not promote any particular curriculum or religious view, this is one book parents should buy! Parents will appreciate practical advice on getting started, adjusting to new roles, designing curriculum that is both child-centered and fun, and planning for social and emotional growth. Parents will turn to their favorite chapters again and again.This book is so much more than just a resource guide for home schooling parents of gifted children. It fills that niche so much better than any other book I’ve found, but it goes so much farther. This book would also be a must read for any home schooling parents and useful for any teacher of gifted students. Each chapter of the book has a section with specific resources, quotes from home school parents and interviews with home schooled students. Homeschooling: The Teen Years : Your Complete Guide to Successfu – Prima Lifestyles 0761520937The teen years are when many homeschooling parents start to question or abandon their efforts. It’s a precarious time, with challenging academics, pressing social issues, and the prospect of college looming. Parents can now breathe easy: this guide calms the teen-time jitters and even offers hope to those just turning to homeschooling now that their child is about to enter high school. With brief “how we did it” testimonies from other parents sprinkled throughout the book, author Cafi Cohen offers sage advice with the turn of every page. A columnist for Home Education Magazine and Homeschooling Today, two of the most respected periodicals on the subject, Cohen has also homeschooled her two children into college. To comfort doubters, she begins with 10 reasons for homeschooling your teenager (work experience, limited peer pressure, and family togetherness, among them). She goes on to devote long chapters to traditional subjects such as math and history, and even gets to those you might not have considered, like driver education. Her suggestions for parents new to homeschooling: decompress slowly, study only one subject a month at first, and read at least one book on learning styles. This approach will save much time and reduce those trial-and-error episodes. The Ultimate Book of Homeschooling Ideas: 500+ Fun and CreativeLinda Dobson – Three Rivers Press 0761563601Book Description: Fun and Effective Home Learning Activities for Every Subject As a homeschooling parent, you’re always looking for new and creative ways to teach your child the basics. Look no longer! Inside this innovative helper, you’ll find kid-tested and parent-approved techniques for learning math, science, writing, history, manners, and more that you can easily adapt to your family’s homeschooling needs. And even if you don’t homeschool, you’ll find this book a great teaching tool outside the classroom. The First Year of Homeschooling Your Child: Your Complete GuideLinda Dobson – Three Rivers Press 0761527885Are you considering homeschooling for your family? Today, many parents recognize that their child’s school options are limited, inadequate, or even dangerous, and an increasing number are turning to homeschooling. But where do you start and how do you ensure the highest-quality educational experience, especially in that pivotal first year? This comprehensive guide will help you determine the appropriate first steps, build your own educational philosophy, and discover the best ways to cater to your child’s specific learning style. Christian Unschooling : Growing Your Children in the Freedom of – Champion Press (WI) 1891400223For too many years, the segment of homeschoolers that consider themselves “Christians” and “unschoolers” have been ignored. Many thought one couldn’t be both a Christian and an unschooler. But Teri Brown with Elissa Wahl expose that not only to Christian Unschoolers exist, they are growing in numbers. Through Christian Unschooling: growing your children in the freedom of Christ, the authors support Christian unschoolers everywhere–letting them know they are not alone. For those Christian parents who are facing school-at-home burnout form a strict schedule, they offer another path to learning. A Survivor’s Guide to Home SchoolingLuanne Shackleford and Susan White – Crossway Books 0891075038A wonderful book full of encouraging ideas about how to really tackle the job of educating whilst keeping house. Written by two home teaching moms, this book answers the questions home schoolers are asking: How can I prevent burnout? What do I do with my preschoolers while I teach? What if my child isn’t “getting it?” How can my husband help? Home Educating With Confidence: How Ordinary Parents Can Produce – GCB Publishing Group 0964539632Written from a Christian prospective, the Boyers show us how ordinary parents can produce extraordinary children. They belive that learning is a natural function and can happen better at home than anywhere else. The Boyers write with love and an incredible respect for their children. Drawing on 17 years of home education experience they show us how to start right and stay right. Schoolproof: How to Help Your Family Beat the System and Learn tMary Pride – Crossway Books 0891074805What is schoolproofing? Schoolproofing means making sure your children get a great education, no matter what political or educational theory happens to be in vogue. It means having children who learn to read in an age of illiteracy; who learn to obey legitimate authority in an age of sullen rebellion; who learn to stand against injustice in an age of craven conformity…. 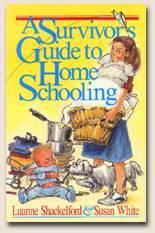 In this practical work by the guru of the Home Schooling movement, Mary Pride covers these important topics: (1) getting organized; (2) motivating your students while respecting them; (3) steps to independent learning; (4) 20 ways to present a lesson; and (5) how to recognize and dump educational clutter. But Schoolproof is much more than a how-to book. You’ll understand why different educational philosophies workâ€”or don’t workâ€”and where we should go from here. The Successful Homeschool Family HandbookRaymond & Dorothy Moore – Nelson Books 0785281754A Creative and Stress-Free Approach to Homeschooling. This is the first book I read when looking into homeschooling. I had no intentions of actually homeschooling, but by the time I had finished reading what Dr. Moore had to say, I was thinking, “How could I NOT do it?” This book has a balanced approach that is reassuring to which our children have responded to beautifully. It was written as very much against early formal schooling and pressuring children before they are ready, but it also does not swing to the other extreme by being too permissive and not teaching anything at all. In fact, being a person who tended to be far too permissive, I was convinced to work harder at being self disciplined for my children’s sake. Laying down good habits is a large part of what Dr. Moore teaches. Having an orderly home is the first step to successful homeschooling, and once that is in place, teaching follows naturally. He shows how learning is part of life, and how to teach especially small children by our warm response to their questions. Covering everything from teaching, reading,and preparing unit studies, to healthy eating, we get a good idea of how learning is a lifestyle and not something we just add to our regular day. The Moores have truly been a blessing to our family. Recovering the Lost Tools of Learning: An Approach to DistinctivDoug Wilson – Crossway Books 0891075836This book brilliantly describes the mess in state education, addresses the Biblical basis of distinctly Christian learning and calls for a return to classical teaching methods. Fun Projects For Hands-On Character BuildingRick Boyer – GCB Publishing Group 964539659This book contains the Boyers philosophy of spiritual training in a nutshell. Scores of simple, enjoyable projects for parents and children together. Chapters include: Building Obedience, Building a Hunger for Righteousness, Building a Forgiving Spiritmemories that will last a lifetime. Speckled with scripture and based on Deuteronomy 6:5 – 9, the Boyer’s teach you how to “teach them [the commandments] diligently to your sons and shall talk of them when you sit in your house and when you walk by the way and when you lie down and when you rise up.” Rick Boyer writes, “You can see that what we are trying to do here is give you some ideas by which you can saturate your child’s home environment with God’s Word. All responsible Christian parents have a deep desire to train their children up in the nurture and admonition of the Lord, but most of us were not brought up in the kind of home we hope to provide for our own families, and we need a little direction as to how to go about the job.” Fun, easy, and filled with common sense, Fun Projects is sure to help. Home Grown KidsRaymond and Dorothy Moore – W Pub Group 0849930073HOME GROWN KIDS (or children!) The Moores believe that many education problems as well as potentially severe damage to family moral and spiritual values can arise from too much formal school too soon. In Home-Grown kids they present well-documented evidence for these conclusions, and they urge parents to consider the option of home teaching, especially in the early years. Homeschooling Methods: Seasoned Advice on Learning StylesGena Suarez – Broadman & Holman Publishers 0805440178For new and veteran homeschool families alike, this extensive new release from the editors of The Old Schoolhouse TM Magazine serves as “a homeschool convention in a book.” It details todayâ€™s most viable education models, helping parents formulate an educational game plan and choose teaching methodologies. There are more than twenty contributors including Christine Field, Jessica Hulcy, Dr. Raymond Moore, and Dr. Ruth Beechick. Catholic Homeschool Companion – Sophia Institute Press 1933184167Hereâ€™s your one-stop resource for information, insight, and inspiration about every aspect of educating your children at home â€” written by those who understand it best: homeschooling parents themselves! Would you like to teach science or phonics better? Introduce your child to Latin, piano, or great works of art? Try new classroom approaches that other parents find effective? In these pages, youâ€™ll find helpful essays from more than forty veteran homeschooling parents to help you do all this and more. Youâ€™ll also find wise advice and practical tips to make you a better teacher and your homeschool more productive and enjoyable. Home Learning Year by Year : How to Design a Homeschool Curriculum from Preschool Through High SchoolRebecca Rupp – Three Rivers Press 0609805851A comprehensive guide to designing a homeschool curriculum, from one of the country’s foremost homeschooling experts. , Rebecca Rupp presents a structured plan to ensure that your children will learn what they need to know when they need to know it, from preschool through high school. Based on the traditional pre-K through 12th-grade structure. The Complete Home Learning Source Book : The Essential Resource Guide for Homeschoolers, Parents, and Educators Covering Every Subject from Arithmetic to ZoologyRebecca Rupp – Three Rivers Press 0609801090his exhaustive and comprehensive sourcebook provides parents and teachers with information on all the resources needed to plan a well-balanced curriculum for the home or the classroom, from preschool through high school. The Complete Home Learning Sourcebook not only covers basic academic subjects–the three R’s–but also addresses interests that are off the beaten path of public school curricula, such as paleontology and meteorology. Thorough and up-to-date, this invaluable resource reviews all possible learning tools: Arranged by subject, including “Philosophy,” “Life Skills,” and “Electronic Media,” the sourcebook’s organization and succinct and insightful entries make it a breeze to use. Icons next to the entries denote the format and intended age group of each resource. Whether readers are looking for the best way to explain relativity or Egyptian mummification, The Complete Home Learning Sourcebook opens the door to a whole new universe for teaching and learning. The First Year of Homeschooling Your Child: Your Complete Guide to Getting Off to the Right StartLinda Dobson – Three Rivers Press 0761527885Are you considering homeschooling for your family? Today, many parents recognize that their child’s school options are limited, inadequate, or even dangerous, and an increasing number are turning to homeschooling. But where do you start and how do you ensure the highest-quality educational experience, especially in that pivotal first year. The Ultimate Book of Homeschooling Ideas: 500+ Fun and Creative Learning Activities for Kids Ages 3-12Linda Dobson – Three Rivers Press 0761563601As a homeschooling parent, you’re always looking for new and creative ways to teach your child the basics. Look no longer! Inside this innovative helper, you’ll find kid-tested and parent-approved techniques for learning math, science, writing, history, manners, and more that you can easily adapt to your family’s homeschooling needs. And even if you don’t homeschool, you’ll find this book a great teaching tool outside the classroom. The Teenage Liberation Handbook: How to Quit School and Get a Real Life and EducationGrace Llewellyn – Lowry House Pub 0962959170You won’t find this book on a school library shelf–it’s pure teenage anarchy. While many homeschooling authors hem and haw that learning at home isn’t for everyone, this manifesto practically tells kids they’re losers if they do otherwise. With the exception of a forwarding note to parents, this book is written entirely for teenagers, and the first 75 pages explain why school is a waste of time. Grace Llewellyn insists that people learn better when they are self-motivated and not confined by school walls. Instead of homeschooling, which connotes setting up a school at home, Llewellyn prefers “unschooling,” a learning method with no structure or formal curriculum. There are tips here you won’t hear from a school guidance counselor. Llewellyn urges kids to take a vacation–at least for a week–after quitting school to purge its influence. “Throw darts at a picture of your school” or “Make a bonfire of old worksheets,” she advises. She spends an entire chapter on the gentle art of persuading parents that this is a good idea. Then she gets serious. Llewellyn urges teens to turn off the TV, get outside, and turn to their local libraries, museums, the Internet, and other resources for information. She devotes many chapters to books and suggestions for teaching yourself science, math, social sciences, English, foreign languages, and the arts. She also includes advice on jobs and getting into college, assuring teens that, contrary to what they’ve been told in school, they won’t be flipping burgers for the rest of their days if they drop out. Creative Home Schooling: A Resource Guide for Smart FamiliesLisa Rivero – Great Potential Press 0910707480For a comprehensive guide to home-based education, that does not promote any particular curriculum or religious view, this is one book parents should buy! Parents will appreciate practical advice on getting started, adjusting to new roles, designing curriculum that is both child-centered and fun, and planning for social and emotional growth. Parents will turn to their favorite chapters again and again. Homeschool Your Child for Free: More Than 1,200 Smart, Effective, and Practical Resources for Home Education on the Internet and Beyond – Three Rivers Press 0761525130Are you considering homeschooling your child, but don’t know where to go for the best educational resources? The Internet is an open door to the biggest library/laboratory the world has ever seenâ€”and it’s all at your fingertips for free! This never-ending source of information, adventure, and educational experiences for the entire family is now compiled in a complete curriculum for any age in Homeschool Your Child for Free. Homeschooling Methods: Seasoned Advice on Learning StylesGena Suarez – B&H Publishing Group 0805440178For new and veteran homeschool families alike, this extensive new release from the editors of The Old Schoolhouse TM Magazine serves as “a homeschool convention in a book.” It details today’s most viable education models, helping parents formulate an educational game plan and choose teaching methodologies. There are more than twenty contributors including Christine Field, Jessica Hulcy, Dr. Raymond Moore, and Dr. Ruth Beechick. The Language WarsRuth Beechick – Arrow Press 0940319098THE LANGUAGE WARS: And Other Writings for Home-Schoolers. This collects under one cover 25 articles by Ruth Beechick which have been published over a couple of decades. Find here the famous response to the “phonics zealots”, the controversial insider views of publishing, the great news on dyslexia cures, and a wide range of other topics. English from the Roots Up, Vol. 1: Help for Reading, Writing, SpJoegil K. Lundquist – Cune Press 0964321033A large format spiral-bound softback book giving an introduction to a selection of common Greek and Latin words which form the basis of some very familiar words. A great aid for spelling and general knowledge. This is the one subject which all my children clamour for every week. Each child builds up a collection of record cards with Latin or Greek words with explanations and examples on the reverse. You could add etymology as a subject in your homeschool. English from the Roots Up, Vol. 2: Help for Reading, Writing, Sp – Cune Press 1885942311This is an excellent book to have and to use in any language arts program. I’ve used it with my grade 3s and my grade 4s. I didn’t use flash cards as suggested; instead, I wrote the root words out on chart paper and then wrote out any words we knew from that root. For instance, “spec” is to see; knowing this, the students could then define spectator and spectacles. The Exciting World of Creative WritingRuth McDaniel – Christian Liberty Press 1930092709To help children of 8 years and upwards develop, in a structured way, their ability to write imaginative and interesting stories. This book is an excellent foundation for developing creative writing skills. Topics covered include the tools needed for writing, review of sentence structures, poetry styles and techniques, writing dialogue, outlining a story, writing powerful beginnings and endings, rewriting and proofreading, manuscript preparation and critiques, copyrights, how to get published, and a Christian philosophy of writing. Language Wars and Other Writings for HomeschoolersRuth Beechick – Arrow Press 0940319098THE LANGUAGE WARS: And Other Writings for Home-Schoolers. This collects under one cover 25 articles by Ruth Beechick which have been published over a couple of decades. Find here the famous response to the “phonics zealots”, the controversial insider views of publishing, the great news on dyslexia cures, and a wide range of other topics. English for the Thoughtful Child, Vol. 1Mary Hyde – Greenleaf Press 1882514076An introduction to teaching basic English for about 7-year-olds. I am using this with 4 children aged from 9 to 5 and all are enjoying it. A very ‘Charlotte Masonesque’ book. Originally published in 1900, it uses wonderful pictures to stimulate the child’s imagination and lead him or her into writing. The grammar introduced includes those things necessary to the writing task. There are memorization assignments, oral compositions, written compositions and practice exercises. Teaching Primaries (Accent teacher training series)Ruth Beechick – David C Cook Pub Co 096360547This book is about 6/8-year-olds what it means to learn concretely instead of abstractly, the best system of memorising and what they can understand about God. Eagle’s Wings Considering God’s Creation (A Creative Biblical Ap – Eagle’s Wings 1931292159A creative in-depth encounter with natural science form a biblical perspective. Adaptable for 7 to 15 year-olds. Large 270-page book with free cassette tape with original, well composed, memorable songs. Carefully prepared teacher instructions. Easy-to-do activities and experiments using items found in the home. 150 exciting, reproducible pages keep creativity and learning high and the stress and mess low. Students end up with their very own fascinating science notebook. Covers: Creation, Universe, Stars, Solar System, Earth, Light, Sound, Wind, Weather, Clouds, Rocks, Plants, Insects, Mammals, Reptiles and lots more. Excellent value! Mr. Pipes and the British Hymn Makers – Christian Liberty Press 1930092121Young teenagers who love adventure and the Christian faith will enjoy reading this fictional accounts of two young Americans who are on holiday in England. These young people wind up learning a great deal about famous British hymn writers as they are befriended by and elderly gentleman called Mr. Pipes. They also learn a lot about the value of traditional worship and praise. A good read-aloud book for younger children. Stories of the Pilgrims – 1930092369With illustrations to help the reader understand a little more of the real life sacrifices and victories of these brave Christians. For age 8+ or reading aloud for younger children. Matin Latin 1 (Matin Latin)Karen Craig – Canon Press 1885767463A course developed by an expert for use by those who aren’t (ie mothers who never learnt Latin but would like their children to do so). After years of teaching Latin and English in day school and homeschool, Karen Craig has produced one of the easiest, step-by-step approaches to beginning Latin. Each segment explains English grammar first, then the Latin, progressing in clear, short steps. Children have been delighted with the format and clarity of the lessons. The teacher’s editions offer not only answers but specific guidance and hints for every lesson. Matin Latin 1 works through the basics of nouns, verbs, adjectives, pronouns, and prepositions, with simple translations throughout, including two short Julia stories to close. The appendices offer additional exercises, along with a complete glossary for the text. The Thinking Toolbox: Thirty-Five Lessons That Will Build Your R – Christian Logic 0974531510The Thinking Toolbox, subtitled Thirty-Five Lessons That Will Build Your Reasoning Skills, combine humor with valuable lessons on right-thinking from a Christian perspective. This fantastic, and colorful book The Thinking Toolbox is one of the most inviting, entertaining and useful books on logic I’ve yet to find. Similar to The Fallacy Detective in format, The Thinking Toolbox takes you even further into the exciting world of logic. Building upon introductory logic, it can be used independent of or as a companion to their previous book, The Fallacy Detective. The Fallacy Detective – 0974531502A wonderful little logic book, that can be enjoyed on several levels. First of all it is a great homeschooling resource. Second, it’s a useful way to get research if you’re stuck on a logic test. Thirdly, it is peppered throughout with great cartoons from the classics “Calvin and Hobbes” and “Peanuts” as well as the less classic “Dilbert.” Lastly, it’s just plain hilarious! You’ll laugh your head off with anecdotes about putting a smoke detector in the fireplace. Absolutely, don’t miss. Zoombinis Logical Journey – Not too long ago, Zoombinis enjoyed the good life. Though they all looked slightly different–different eyes, noses, hair, feet–such differences meant nothing to the Zoombinis. And so they lived happily on Zoombini Isle, making small, useful products, which were prized the world over.” So begins an unsuspectingly addictive CD-ROM, featuring uncommonly fun reasoning games that require serious problem solving and math-thinking work. Yet the perils that face this cheerful society are not as fearsome as the amount of time you’ll potentially spend on this pursuit. Beware the chubby, chattering Zoombinis if you don’t want to get hooked to your computer for at least 90 minutes a session! Intermediate Logic: For Christian, Private & Home SchoolsNance – Canon Press 1885767137Where do you go in logic after you’ve mastered beginning logic? Intermediate Logic by James Nance takes students and parents to the next levels. James Nance is the logic instructor for the eighth-grade class at Logos School, Moscow, Idaho, and this material has been tried and refined for years. This text is an excellent follow-up to Doug Wilson’s Introductory Logic in the Mars Hill Series. Together they can constitute a full, one-year course in logic. Covering topics in logic too often reserved for a college course, this text simplifies formal proofs and truth trees for propositional logic for the eighth grader and up. Introductory Logic – Canon Press 1885767366Designed for junior high use, these lessons cover logical statements, fallacies, syllogisms, and many other elements. This course is a thorough introduction and serves as both a self-contained course as well as a preparatory course for more advanced studies. The Gift of Music: Great Composers and Their InfluenceJane Stuart Smith and Betty Carlson – Crossway Books 089107869XThis book will help you to develop an appreciation of classical music by re-telling briefly the lives of some of the most famous composers. The more we acquaint ourselves with that which is truly great and beautiful, the more we will dislike and turn away from that which is shallow and ugly (a quote from the `prelude` to the book). An excellent book for the layman and essential for the Christian home. Reader Rabbit Math Adventure Ages 6-9 (Jewel Case) – B00005IB4SEditorial Review:Product Description:Now with A.D.A.P.T. Learning Technology that helps children build critical elementary math skills. Kids will explore Pirate Island with Sam the Lion, Penelope the Parrot, and Reader Rabbit. Each fun activity has many play levels, progressing from the easiest to most difficult. The Grapes Of MathGregory Tang – Scholastic Press 043921033XGreg Tang shows readers creative ways to use patterns and combinations of numbers to solve math puzzles quickly and effectively. The Grapes Of Math by Gregory Tang and Harry Briggs has one genre of math problems presented in an amusing fashion with good art. The genre is patterns of objects with breaks in the patterns. The children are expected to look at the patterns as groupings or shapes to figure out the total number of objects without counting one-by-one. This is a good book. The kids like it. The problems are amusing, even bordering on tickling. My only problem with this book is that an overview of methods for solving the problems should be at the beginning. But so what? There are a few ways to look at the problems and the kids actually sit down to do them without being pestered. Have Fun. Learn Stuff. Grow. : Homeschooling and the CurriculumDavid H. Albert – Common Courage Press 1567513700Education is not so complicated! Gently and passionately, homeschooling advocate and author David H. Albert insists that the curriculum of love is not about externals. It is about what is essential in each individual human being and in every child. Its code words are communication, inquisitiveness, acceptance, joy, honesty, courage, and, curiously, perhaps above all, intimacy. It demands that we assist our children in seeking to embrace a world that is their own. Internationally renowned homeschooling speaker, magazine columnist, author, and father of two, David H. Albert carries forward the ideas of John Holt and John Taylor Gatto and empowers parents in the process. He lives in Olympia, Washington. Teaching Children: A Curriculum Guide to What Children Need to KDiane D. Lopez – Crossway Books 0891074899A curriculum guide to what children need to know at each level up to age 12. Teaching Children draws on Charlotte Mason for its educational approach integrating a Christian world view and Scriptural principles. It applies a literary, written and verbal approach to learning, presenting a logical sequence of skills, concepts, and content. This book is for everyone who desires to enrich a child’s learning experience. 100 Top Picks For Homeschool Curriculum: Choosing The Right CurrCathy Duffy – Broadman & Holman Publishers 0805431381The key to successful home education, homeschool veterans will tell you, is determining your educational philosophy and marrying it to your childs learning style. Then you can make an informed decision in choosing the right educational curriculum for the child. This is the formula for success. In 100 Top Picks for Homeschool Curriculum, homeschool guru Cathy Duffy can help you accomplish these critical tasks. Cathy will give you her top choices from every subject area, approaching everything through a Christian worldview perspective. This book is a critical volume for the homeschooling community. The key to successful home education, homeschool veterans will tell you, is determining your educational philosophy and marrying it to your childens learning style. Then you can make an informed decision in choosing the right educational curriculum for the child. This is the formula for success. Home Learning Year by Year: How to Design a Homeschool Curriculum from Preschool Through High SchoolRebecca Rupp – Three Rivers Press 0609805851Finally, homeschoolers have a comprehensive guide to designing a homeschool curriculum, from one of the country’s foremost homeschooling experts. , Rebecca Rupp presents a structured plan to ensure that your children will learn what they need to know when they need to know it, from preschool through high school. Based on the traditional pre-K through 12th-grade structure. Recovering the Lost Tools of Learning.Douglas Wilson. – Good News Pub 0891075836This book brilliantly describes the mess in state education, addresses the Biblical basis of distinctly Christian learning and calls for a return to classical teaching methods. The Trivium : The Liberal Arts of Logic, Grammar, and RhetoricSister Miriam Joseph – Paul Dry Books, Inc. 0967967503Opening the door for beginners who seek a thorough grounding in the first arts of human understanding, this book explains the nature of logic, grammar, and rhetoric-the three of the seven liberal arts-and how they relate to one another. In Renaissance universities, the trivium (literally, the crossing of three part way) formed the essence of the liberal arts curriculum. Examined are topics such as the nature and function of language, distinguishing general grammar from special grammar, the study of logic and its relationship to grammar and rhetoric, and applying the concepts of logic, grammar, and rhetoric to literary works. Repairing the RuinsDouglas Wilson – Canon Press 1885767145A Classical and Christian Challenge to Modern Education. This collection of essays from teachers and administrators extends the discussion beyond the basics. It not only delves deeper into foundational issues, it focuses on practice, providing concrete instruction for dayschool and homeschool teachers, administrators, parents, and students. Divided into three major sections, the book first sets the framework of Christian worldview thinking. The second section develops the more practical side of the classical model, focusing on specific disciplines. The final section explains how to make this model work in this century. A Greek Alphabetarion: A Primer for Teaching How to Read, WriteHarvey Bluedorn – Trivium Pursuit 0974361690Before we can learn a language, we must master its alphabet. This new edition of A Greek Alphabetarion has been thoroughly revised and reformatted to make it easier for parents to teach their children, and for older students to learn by themselves. A syllabary (practice blending consonants and vowels) and a chrestomathy (practice reading sample passages) have been added in this new edition. A Greek Alphabetarion teaches the Greek alphabet in alphabetical order, letter by letter, using a rhythmic cadence to aid the students memorization. Then, it teaches the alphabet in phonetic order, classifying each letter by its sound. A Greek Alphabetarion helps the student step-by-step to master reading Greek before moving on to study Greek grammar. Suitable for all ages, child through adult, in homeschools, private schools, colleges, and seminaries. Pronunciation CD included.